Bill James, baseball’s most influential statistician, ranks him as the greatest second baseman in major league history, and fans that watched Joe Morgan play at Jarry Park would probably agree. In 43 games at the old Montreal ballpark, the 5-foot-7, 160-pound second baseman clubbed seven homers and recorded a .425 on-base percentage (OBP). His most memorable hit at Jarry Park was likely the grand slam he belted off of Expos right-hander Steve Dunning on July 5, 1976 to lead the Reds to a 11-2 victory. 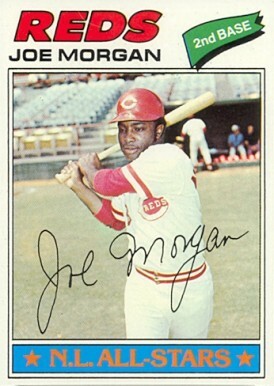 Morgan notched five RBI in that contest – it was one of six, five-RBI games he’d enjoy in his big league career. But Morgan could beat the Expos in multiple ways. In addition to his seven homers, he also tallied 39 runs, 43 walks and 17 stolen bases in his 43 games at Jarry Park. 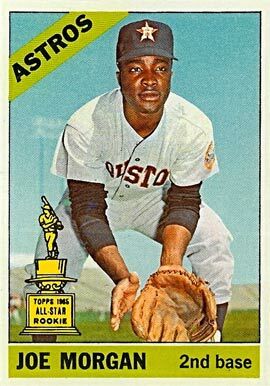 Born in 1943 in Bonham, Texas, Morgan was signed by the Houston Colt .45s as an amateur free agent in 1962. He rocketed through Houston’s minor league system to make his big league debut on September 21, 1963. He starred with Houston for parts of nine seasons, before being dealt to the Cincinnati Reds, with whom he won two MVP awards and became arguably the most important cog in the Big Red Machine that won back-to-back World Series (1975, 1976). He finished his playing career with stints with the Astros, Giants, Phillies and A’s. In all, in 22 big league seasons, he registered 2,517 hits, 1,865 walks (fifth all-time), 268 homers and 689 stolen bases (11th all-time). He was also selected to 10 all-star games and won five Gold Glove Awards. For his efforts, he was elected to the National Baseball Hall of Fame in 1990, his first year of eligibility. – Including his aforementioned success at Jarry Park, Morgan played 157 games against the Expos and tallied 110 runs, 126 walks, 22 home runs and 40 stolen bases. At Olympic Stadium, the Hall of Fame second baseman had 20 runs, 21 walks, five home runs and five stolen bases in 38 contests. – In 1984, Morgan played his sole series at Exhibition Stadium in Toronto. 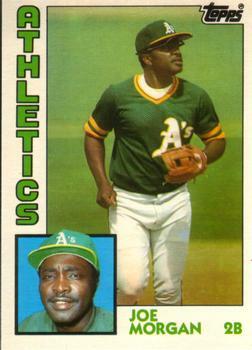 That year, he suited up for the Oakland A’s in his final big league campaign. The A’s visited Toronto from June 28 to July 1 and Morgan hit safely in all three games he played in the four-game series. His first hit against the Blue Jays was an RBI single off of lefty Jimmy Key that drove in Rickey Henderson in ninth inning in the A’s 9-6 loss on June 28. His last hit at Exhibition Stadium came on Canada Day, when he singled in the first inning off of Luis Leal in the A’s 7-6 loss. – If you count the series the A’s played at home against the Blue Jays in 1984, Morgan was 8-for-29, with five walks and a .383 OBP versus the Blue Jays. – Competing for the Houston Astros against the Milwaukee Braves at County Stadium in Milwaukee on July 8, 1965, Morgan posted the only six-hit game of his career. In that 12-inning affair, Morgan went 6-for-6 with four runs, including two home runs. Two Canadians also pitched for the Astros in that game. Left-hander Ken MacKenzie (Gore Bay, Ont.) struck out the only batter he faced in the 11th inning before handing the ball to right-hander Ron Taylor (Toronto, Ont.). Unfortunately, Taylor allowed the winning run in the bottom of the 12th and the Braves won 9-8. – On August 21, 1973, Morgan, then with the Reds, socked a seventh-inning pitch from Canadian Fergie Jenkins (Chatham, Ont.) over the fence for his 19th homer of the season and 96th of his career. It was a two-run blast (Pete Rose was on base in front of him) that temporarily tied the game 4-4, before the Cubs regained the lead and won 6-4. Just five days later, Morgan took another Canadian deep for his 20th homer of the season and 97th of his career. This time it was Swift Current, Sask., native Reggie Cleveland whom Morgan victimized in the seventh inning with Rose on base in front of him. Morgan’s blast accounted for the Reds’ final two runs in their 4-1 win over the St. Louis Cardinals. – Speaking of Jenkins, Morgan and Jenkins were teammates on the 1972 National League All-Star team. Jenkins didn’t appear in the game that was played at Atlanta Stadium, but Morgan played the entire contest at second base and delivered a single off of Baltimore Orioles left-hander Dave McNally that scored Nate Colbert in the bottom of the tenth inning to give the National League a 4-3 win. – By my count, Morgan had six Canadian teammates during his professional baseball career (hometown, team, years played with Morgan): Paul Runge (St. Catharines, Ont., Durham, Modesto (Class A), 1963), Claude Raymond (St. Jean, Que., Houston Astros, 1964 to 1967), Ron Taylor (Toronto, Ont., Houston Astros, 1965, 1966), Ken MacKenzie (Gore Bay, Ont., Houston Astros, 1966), Terry Puhl (Melville, Sask., Houston Astros, 1980) and Gordie Pladson (New Westminster, B.C., Houston Astros, 1980). Thanks, Scott. I’d love to find a photo of Morgan at Jarry Park or Olympic Stadium.